A subdued group of mourners surround a grave; the vicar ends the benediction and they all depart with the undertakers, leaving the sexton (Victor Platt) to fill in the open grave. He wipes his brow after finishing the mound and, after he's gone, there's a movement in the soil, then a bright chrome aerial extends from under the ground. At one of Britain's early-warning radar stations, section 3 of the scope fails, alarming Dr Palmer (Aubrey Richards) and his staff. They're not the only ones - Dr Johnson (Paul Massie) and his aide, Baron (Ray Austin), leap into action when they see "it's on the blink again". They summon the undertakers and tear off across the countryside. Steed and Mrs Peel are called to Palmer's station and he warns them that a complete blackout of the screen could mean a missile attack on Britain would go undetected. He declares it must be a natural phenomenon - people have been trying to block radar for years with no success. He tells them it was the life's work of Dr Marlow, who had worked with him until four weeks ago; Steed asks for a forwarding address and is told he died. Steed examines Marlow's file and asks Mrs Peel to check the records while Palmer shows him on a map the affected area and likely location of any hypothetical device - there's nothing in the area but the small village of Pringby. Palmer is struck by the coincidence - Pringby is where Marlow was buried. Steed hurries to the church where the sexton tells him Marlow wasn't from the area but insisted on being buried there and his relatives went to great trouble and expense to bury him there. Now they've changed their minds - he's just been exhumed, and the sexton points out the departing undertakers. Steed follows them to "The Sir Horace Winslip Hospital for Ailing Railwaymen" where Dr Johnson wheels the coffin into an operating theatre. 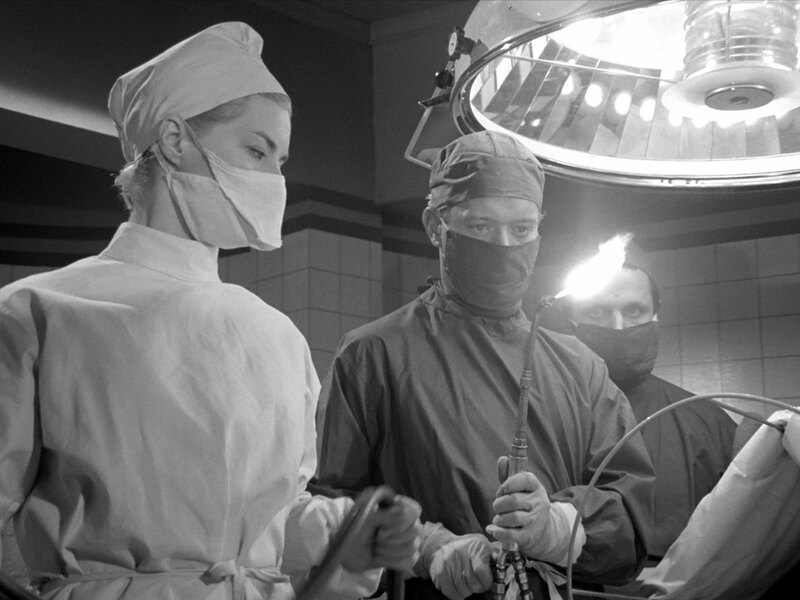 Steed pinches a carnation from a florist's box labelled "Charnley's" and encounters Nurse Spray (Wanda Ventham) who tells him she's never seen Marlow - at that moment Marlow (Lloyd Lamble) pokes his head out of the operating theatre and is recognised by Steed. He departs hurriedly when the matron, Miss Thirwell (Caroline Blakiston), comes down the stairs and barks at Nurse Spray. Johnson warns Marlow to stay out of sight and will be paid when everything is ready. Miss Thirwell enters and tells Johnson that a man was snooping and asked for Marlow. He orders her to warn Baron but Steed slips past her a moment later as she checks her revolver. He enters her room, where Sager (Steve Berkoff) is lurking in a wheelchair. Steed claims to be from the Footplateman's Friendly Society, conducting a check of the hospital, and signs his cast. He sees the undertakers on the move again outside and says if Sager wants anything - grapes, oranges, magazines - he should let him know. "Grapes", growls Sager, "I'd like some grapes", and flourishes a revolver. "Desperate for them, I'd say", quips Steed then Sager stands up - leaving the cast attached to the wheelchair. "A remarkable recovery", Steed jokes then pulls the rug out from under Sager's feet and slams the wheelchair into him. Baron spots Steed from the halls and rushes in; he throws himself at Steed who adroitly steps aside and Baron and Sager crash into and over the desk. Steed beats a hasty retreat before Johnson and Thirwell arrive to survey the damage. Thirwell is alarmed he escaped and says Marlow musn't be found there; Johnson tells her to ring Miller and prepare for business in Carling St.
Mrs Peel finds an appointment in Marlow's diary at 22 Carling St - on the day he died - and visits. 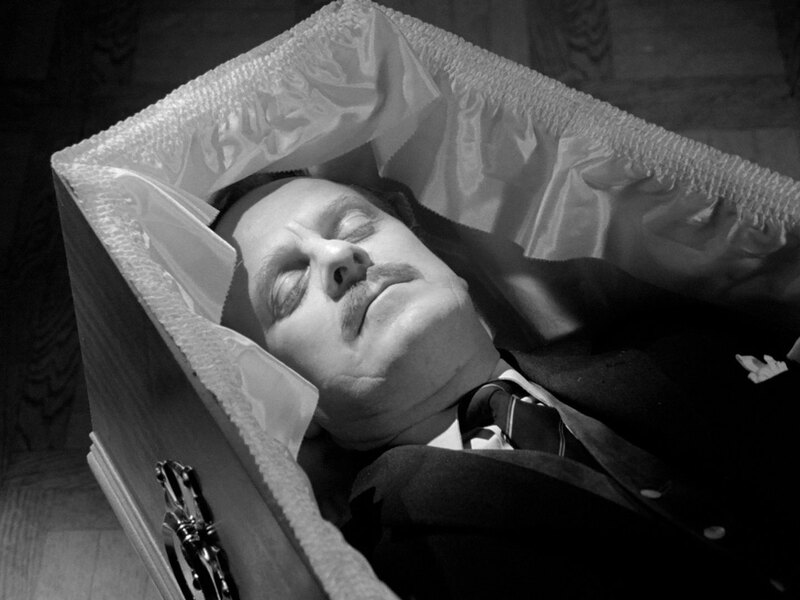 She discovers it's a funeral parlour - Miller & Son - and finds Marlow, lying in state in a coffin. She visits Steed who tells her he saw Marlow alive at 11:30 and she counters that he was dead at 1pm, supposedly a Hubert Smith from the Winslip Hospital. Steed grins and says she'd make a fine nurse and while she's "waggling her thermometer" he'll tackle Sir Horace. Miss Thirwell instructs her sternly but Nurse Spray tells her it's an easy job with lots of time off when they're operating. Jonson is suspicious but Miss Thirwell tells him they're obliged to take on a quota of trainees. Steed arrives at Sir Horace House, "Winslip Junction", which is done up like a railway station - he even has to blow a whistle and buy a platform ticket to gain entry. 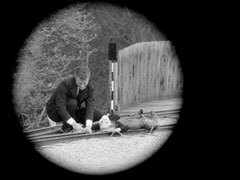 Fred (Charles Lamb) clips his ticket and rings the guv'nor, Sir Horace, who sits the other side of the drawing room that has been decorated with false tracks, platform awnings, a signal box and half a train carriage. Sir Horace (Ronald Fraser) introduces himself affably and tells him he's in time for the first sitting for lunch, and leads him to the carriage. Poor Fred leaps into action, turning on fans, rocking the carriage, and running a revolving scenery canvas and gramophone while they eat. Sir Horace tells him he can't travel any other way - wouldn't be able to enjoy a meal. He'd grown up on trains whence the family fortune is derived. Steed again says he's from the Footplateman's Friendly Society, touting for a donation, and is astonished when Sir Horace happily offers him 10,000 guineas. Horace says railwaymen are the salt of the earth, then their strange journey comes to an end. They disembark and Horace show Steed the wreaths he's hung for each line, murdered by the motor car. Steed notices the flowers come from Charnley's - and at the hospital Emma is arranging flowers from the same source. She's just discovered an unnaturally heavy box of flowers when Miss Thirwell orders her to go to Ward C. Thirwell then takes the box to Dr Johnson, who tells her they'll operate that night. Horace meanwhile is droning on about trains being superceded by cars. He tells Steed he leaves the running of the hospital to Johnson and Thirwell, he just puts up the money and blusters a bit when Steed suggests it might be misused. 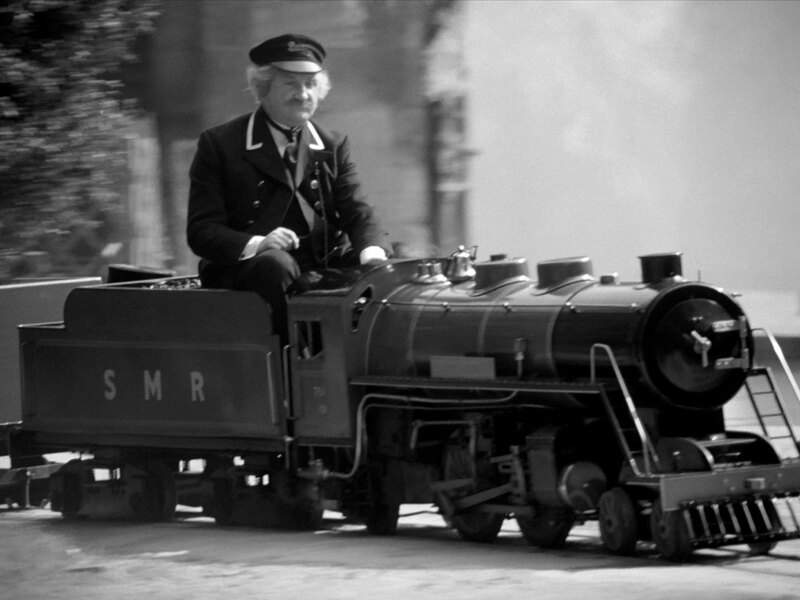 He declares his staff are first-rate and even have a scheme... he stops and tells Steed not to touch a particularly new looking lever then claims to have forgotten what the scheme was, and suggests a tour of the grounds - on his personal engine, John of Gaunt. Steed enjoys a breezy ride on the miniature train and arrives at the hospital just after Mrs Peel has learned they're operating that night, but Baron won't let her near the theatre. Steed arrives and they see Miller (Bryan Mosley) and Sager wheeling a gurney in. They're followed by the undertakers with a coffin, prompting Steed to observe, "They don't hang around here". In the theatre, Dr Johnson asks for forceps, then a scalpel; Miss Thirwell dabs his brow and he then requests a blow torch. Steed and Mrs Peel decamp to Charnely's, where they find a box containing electrical components, and a door connecting it to Miller's funeral parlour. 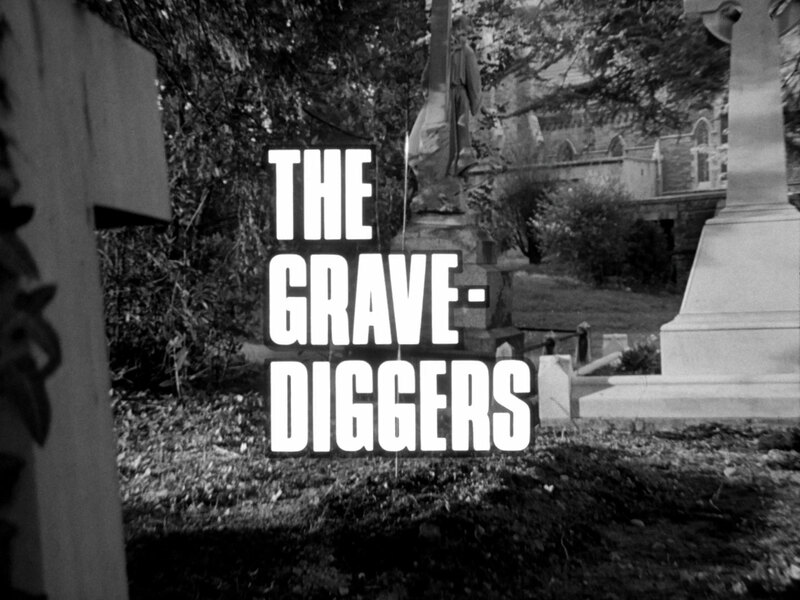 Mrs Peel discovers a hole in a coffin lid, under an RIP plaque and Steed discovers funeral booking months in advance - they plot the locations of the extraordinary funeral and find they make a ring around the radar station. The undertakers arrive and swap over the coffins. After they've gone, Emma finds the new coffin has a telescopic antenna which extends from its hole when she shines a torch on it - they reason a plot to bury jamming devices around station so a missile attack could be launched against Britain, but the central control would have to be big, with buttons and levers. Steed realises it's Sir Horace's signal box. Emma returns to the hospital and overcomes Miss Thirwell, then takes her place in the theatre - a fact obvious to everyone, but Dr Johnson makes her assist him nonetheless - it's the last device. They complete the operation and Mrs Peel is hoping to get away but Miss Thirwell returns with Baron, who has freed her. 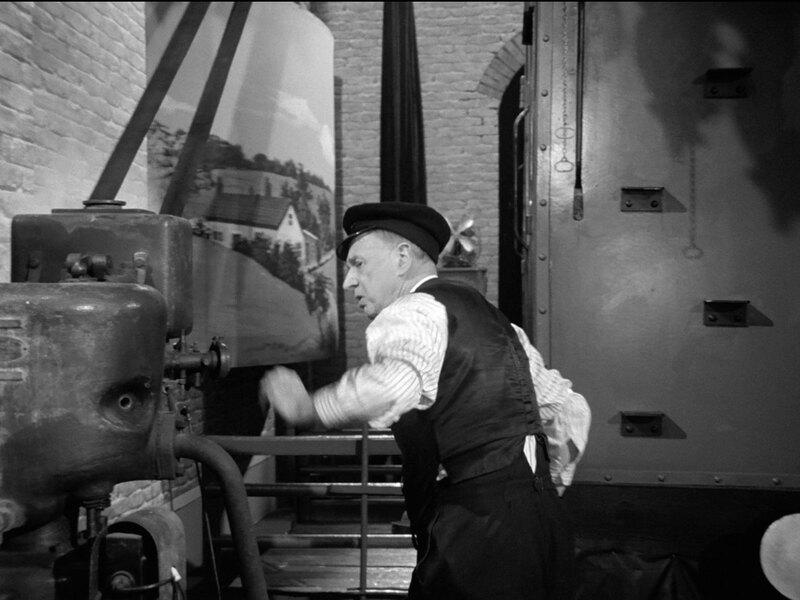 Steed meanwhile is investigating the signal box, Sir Horace busy driving around on his train. The villains are wondering what to do with Mrs Peel - Miller refuses to kill another so soon, then they hear the train and decide an 'accident' will solve their conundrum - "everyone knows the old man is batty". Fred meanwhile has spotted Steed investigating the box and tries to hit him with a sledgehammer. Sir Horace returns and tells him he knows what the box is for and tells him it's to jam motor car engines, returning his beloved trains to their rightful place. Sir Horace is flabbergasted when he learns what the device is really for. They hear the train and Sir Horace sees though his telescope that Mrs Peel has been tied to the tracks. Steed rushes off, leaving him to say, "What extraordinary people!" Steed intercepts the train and throws Sager from it, then has to take cover from Baron's gunfire. Sager returns and tries to leap back onto the train but is flung aside by Steed. The train bears down on Mrs Peel, to the accompaniment of silent film piano music, and Baron sets off down the train to tackle Steed. they fight and Steed manages to throw Baron from the train just in time; he leaps from the trains and rushes to the junction switch, and sends the empty train rattling down a siding. Steed frees Mrs Peel then Dr Johnson appears, wielding a revolver. Steed wrestles him over to Mrs Peel, who is lying on the ground. She grabs him with her legs, scissor-fashion, and hurls him into the pond. The Avengers set off sedately, in reverse, on the miniature train. Steed says he always thought he was cut out to be an engine driver, but came to his senses at the last minute - "No sense of security, always on the move". Mrs Peel dryly observes that it would at least have kept him on the straight and narrow.